It’s monsoon month here in Korea and my students have been arriving with all manner of different size / shape / color / cartoon character umbrellas but by far, the most interesting one was the ‘I drew my own umbrella’ umbrella from one of the girls in my last class on a Thursday. As the girls insisted on being in the photo, I can only publish a section of the arty umbrella but what a fantastic idea for a rainy day…literally. 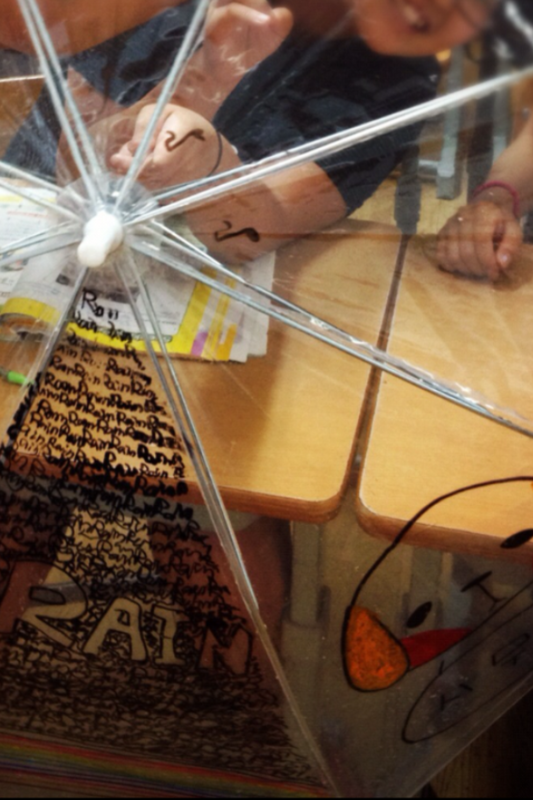 Decorate your own umbrella, go play outside in the rain with it!! Perfect! In honor of Rebecca’s umbrella, I recalled wandering upon this smart art online. I’ve lost the source but if you know it, send me an email and I’ll link it / credit it, no problem! And of course, there’s always more in The Index.